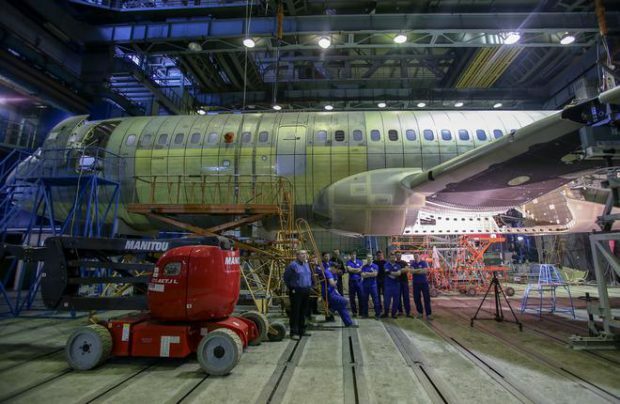 Russia’s Irkut MC-21-300 narrowbody pogram has passed an important milestone in static tests. The aircraft’s composite wingbox was destroyed by exposing it to loads that were higher than 90% of the ultimate load. The aircraft’s designer, Irkut Corporation, told Russian Aviation Insider that the wing fatigue testing had been completed at the end of February. The reserve factor demonstrated by the wing is sufficient for starting flight tests, but the company still intends to reinforce the wing structure. Before the start of the testing, the areas of the wing structure which would experience maximum loads in flight were intentionally damaged to the maximum extent that did not leave any visually distinct traces. The tests were carried out on an alleviated wing; the reinforced wing will weigh 25 kg more. The reinforcement will be performed without unmating the wing from the fuselage. The modification will be documented, and all the subsequent prototypes will receive a reinforced wing. The wing could be reinforced after the prototype’s maiden flight, but this would take more time as the fuel would have to be drained and the tanks dried. Instead, Irkut opted for testing the alleviated wing, because “[a wing] is easier to reinforce than alleviate”, a spokesperson said. The company may have considered the recent experience of Chinese airframer Comac, which produced an overly reinforced wing on its C919 airliner and will now have to make it lighter. The Irkut spokesperson said that the program is proceeding on schedule. The MC-21’s systems are being tested on the prototype set to first fly in April, as stated earlier by Deputy Prime Minister Dmitry Rogozin. The static tests are being carried out at the Central Aerohydrodynamic Institute (TsAGI) in Zhukovsky outside Moscow. As reported earlier, they are one of the stages of fatigue testing, which precedes the first flight. The MC-21-300, the first member of the planned MC-21 family, is designed to seat between 163 and 211 passengers. The smaller MC-21-200 version with 132 to 165 seats is to follow. The aircraft will be initially certified with Pratt&Whitney PW1400G engines; the alternative Russian-made Aviadvigatel PD-14 powerplant is currently under development. The MC-21 is set to compete against the Airbus A320neo, the Boeing 737MAX, and the Comac C919.